Optimizing websites for good search engine ranking has changed over the years. 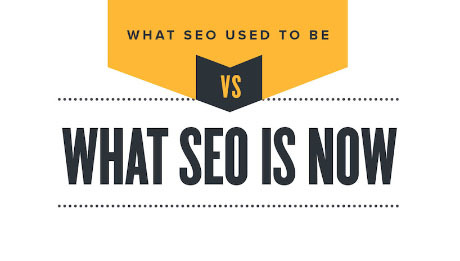 This SEO infographic shows what SEO used to be vs what SEO is now. The world of email marketing has seen its fair share of changes over the years, but few industries change as much in a short time as SEO. Achieving great search engine ranking costs time and effort. And just like email marketing, SEO can get quite technical. If you’re still creating content just around single keywords, and doing bad linkbuilding, it’s time to change your ways. Creating content for search engines won’t work anymore in 2015: creating content for a specific audience that is searching with a specific intent will work much better. This means thorough research into analytics, your audience’ intention and their needs and wants. When you have quality, unique and relevant content, the traffic will come, and the people will value the effort you have put into creating that content.